The following anonymous story reminded me of last week’s public statement by Leiby Kletzky’s parents urging us all to “perpetuate the feeling of collective responsibility and love expressed during the search for Leiby. An additional act of kindness toward your neighbor, or to those less fortunate than you, can go a long, long way toward perfecting our world.” A special thanks to the anonymous JewishMOM who sent me this moving story about her small act of kindness that dramatically changed the life of an entire Jewish family. My parents are shluchim of the Lubavitcher Rebbe in a city with a weak Jewish community. Growing up, we were the only observant family for miles around. I always had a very clear view of my mission as a junior shlucha, so when I became a bat mitzvah I decided that my hachlata tova (a good decision or undertaking in honor of a special occasion) would be to take a more active part in shlichus. I decided that every week I would distribute Shabbos candles and challahs to Jewish women patients at one of the local hospitals. 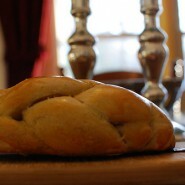 So on Fridays, at recess, I used to braid small challahs and after school I would take them along with candles and some pamphlets about Shabbos and candlelighting times to the hospital. I used to be a very shy teenager and it was extremely hard for me to knock on the hospital-room doors, introduce myself, and explain the reason for my visit. But remembering my hachlata tova, I forced myself to do my rounds of the hospital every week. Most of the time the patients were very touched by my visit, but sometimes people thought I was trying to sell something and declined, or other times it turned out that the patient I had visited wasn’t even Jewish. Many other times I entered a room and the patient wasn’t there, so I just left the challahs, candles, and pamphlets on the table. I assumed that the patients who found my “gifts” would probably eat the challah, throw away the pamphlets, and wouldn’t know what to do with the candles. Last year my mother was visiting a different city over Shabbos and she gave a class on Shabbos afternoon. After the class a lady came up to my mother and said she wanted to thank my mother for the family she has today. And the lady, sensing my mother’s confusion, told my mother the following incredible story: “I actually never met you personally…but 15 years ago I gave birth to twins prematurely. Their condition was so grave that even though they were born on a Wednesday, I wasn’t allowed to even see them until Friday. They were both in incubators and they looked like de-feathered chickens, gray skin and full of tubes. “I wanted to give up. I wanted to pack my bag, and leave that hospital and those babies behind…forever. This is what the Rebbe always teaches us: We must reach out to our fellow Jews. We must do what we can to touch other souls.